Alan contacted us over a month ago inquiring about a potential website design. 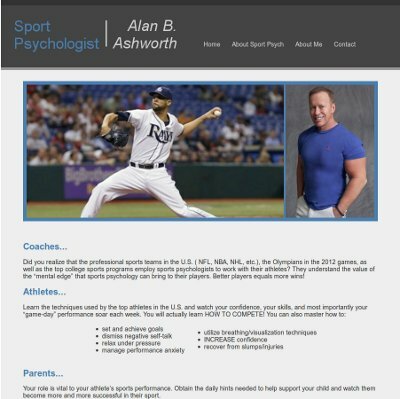 He is a Sport Psychologist located in the Dayton Ohio area. He originally requested us to provide an estimate to him for a basic website and a few add-on features. A few weeks later, he let us know that there was another designer that he was previously working with, but they were not able to complete the website to his satisfaction and the previous website designer gave up. Based upon the updated request he had, we provided him another estimate, at which he also requested bids from others. In the end, Alan chose BsnTech Networks to create an affordable website design. We worked closely with Alan to obtain the information and graphics that he wanted on the website and pieced it together over a couple of weeks. Just this evening, Alan said that we had perfected the website and it was exactly what he wanted! We appreciate ethe business from Alan and will continue to work with him as he needs updates made to his website. Alan’s website is at alanbashworth.com.